Hotbox is known for having a nice hard shell, which allows it to shoot through a variety of markers. 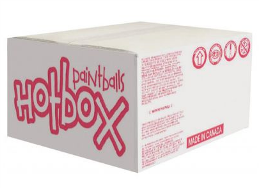 Whether you are going camping with friends for a game, or going up the mointain for a hillside game, Hotbox ammo offers a fantastic, affordable solution. XO Industries Spectrum quality field paint is the perfect ball for team practice. Boasting a field grade shell, thick fill and straight accurate shooting. 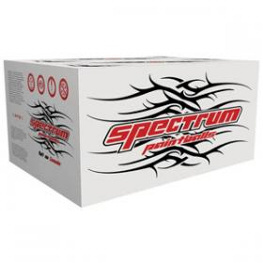 Spectrum is one of the many reasons that makes this ball very addictive. The BT-4 Combat™ is the marker that started the BT-4 Series. It’s the perfect scenario or woods ball marker which allows you to build the perfect one-of-a-kind beast. Fully upgradeable, the Combat is the scenario marker by which others are judged. This reliable and accurate marker is the obvious choice for use in your scenario or woods ball event. The front grip is removable and the military standard dual Picatinny rails accept many tactical upgrades like optics and other accessories like the BT Flashsight. The trigger system can be enhanced with by installing the Double Trigger and Electronic Grip Frame to increase your rate of fire. With available upgrades like the HALO™ powered Rip Clip™ and Apex™ Barrel system, the BT4 Combat is the core of our successful BT4 line of markers. 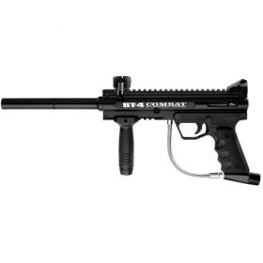 If you are looking to customize your paintball gun, start with the BT4 Combat and open a world of realistically styled marker configurations.